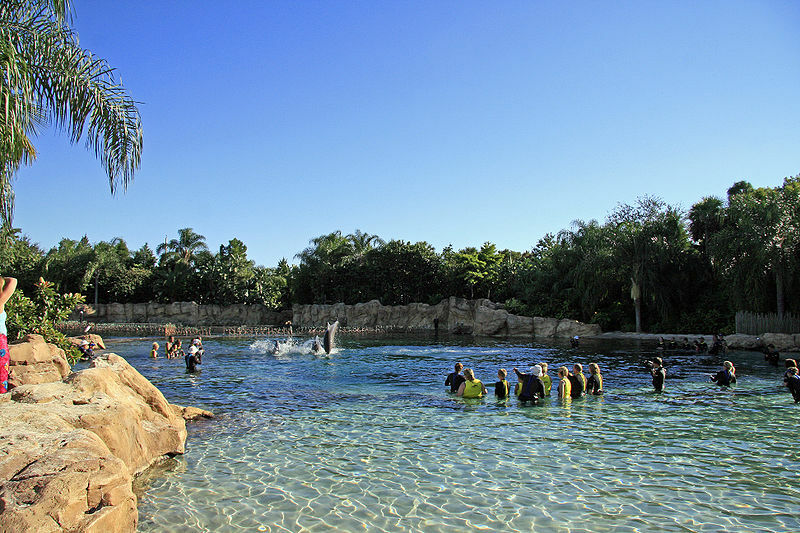 Discovery Cove is SeaWorld’s boutique park that lets you experience an all-inclusive vacation experience for a day where you get to swim one-on-one with dolphins, sting rays, and tropical fish. It is the equivalent to a dolphin excursion that you might take on a Caribbean cruise but is a whole lot more. I was able to experience Discovery Cove several years ago for an anniversary trip and strongly recommend making it a day if you have ever been interested in doing a dolphin encounter. When you first arrive at Discovery Cove, you setup a registered time for your dolphin swim. While you are waiting for your swim, there is a wading sting ray pool with sting rays swimming around your feet and a larger snorkeling lagoon with massive sting rays and tropical fish swimming around you. There is a bird sanctuary with larger meat-eating tropical birds walking around the grounds and a lazy river that runs through it. SeaWorld just recently announced a major expansion coming to Discovery Cove in 2011 where individuals will be submerged in a lagoon with venomous lion fish, sharks, and eels that can be viewed through large panoramic windows. One of the biggest differences between Discovery Cove and all of the other experiences in Orlando is the cost of the admission. Prices can range in the type of experience you want from the low $100’s to the $400 range a ticket. Most standard dolphin swims are in the $200 range. Again, comparing the cost of an all-day experience to a 3 to 4 hour excursion on a cruise shows that Discovery Cove is a much better option. Your lunch and drinks are included, you get a seven day pass to either Sea World or Busch Gardens with your admission price, and we were able to get a significant discount at the Renaissance Orlando hotel when we bought our tickets for Discovery Cove in a package deal. If you dedicate your vacation to just Sea World parks when going to Discovery Cove, it comes out to be a good overall value. This entry was posted in Attractions and tagged international drive, seaworld, theme parks, wildlife. Bookmark the permalink. ← Are there fireworks at Lake Eola on New Years Eve?